The current agricultural land use and drainage of peatlands causes peat oxidation which results in CO2(-eq) emissions, soil subsidence, lowering of water- and soil quality and a lesser biodiversity. This degradation of peatlands is especially problematic around raised bog nature reserves such as Bargerveen because they require wet conditions for their conservation. To restore this valuable raised bog ecosystem and its services, surrounding lands need to be rewetted and the problem of nutrient overloading in the raised bog nature reserves need to be solved. This thesis explores the implementation of large-scale paludiculture, the productive use of wet peatlands by agriculture, to support the restoration of the raised bog ecosystem, to stop peat oxidation and to create a regenerative raised bog landscape. 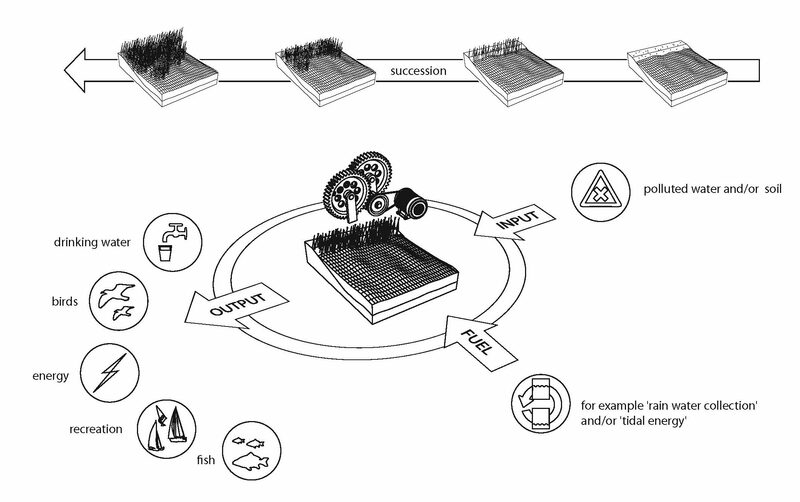 Analysis revealed how the raised bog landscape functions (Figure 1 top), how it is degrading (Figure 2 middle) and what interventions can be taken to regenerate it (Figure 3 bottom). The most promising paludiculture crops for the raised bog landscape are cattail, reed, willow and peat moss. Designs were made for two areas with the largest hydrological influence on Bargerveen, the area of Nieuw-Schoonebeek in The Netherlands and the polder of Annaveen in Germany. The knowledge gained from these designs is then applied in a design for the larger landscape entity of international nature reserve Moor-Veenland, connecting several raised bog nature reserves with the stream valley and canal as leading structures. The proposed interventions in the designs consist out of implementing a paludiculture system, shallowing and filling in ditches, placing weirs, creating dikes and re-meandering the stream. This, together with the simulation of a Moorausbruch (Figure 4), leads to an improved hydrology and a solution for nutrient overloading, resulting in a regenerated raised bog landscape. With the designs, a landscape can arise in which agriculture and nature complement each other and where new possibilities and opportunities arise (Figure 5 and 6). This proposed ‘paludiculture Landscape Machine’ in the raised bog landscape, leads to the production of clean water, an abundance of biodiversity and raw materials (for bio-energy or construction material), sizeable CO2-eq reduction, water storage and retention, peat accumulation and recreation.